Writing is the hub of my wheel and where I began at the age of seven, but that wheel has many spokes as author, actress-storyteller, teacher and healer. I’ve been called an artist with the tools of healing, a peace coach and a creativity jump-starter. I am dedicated to enhancing your Creative Spirit. The true spirit of this work is to inspire creativity, laughter & peace, alleviating suffering in the hearts of the people. I love the art or storytelling in any form and playing with the Word, be it on the page or the stage. Appreciative Inquiry and an indescribable “It” factor play into serving clients and audiences, finding pleasure points, not pain points. For when you are involved with your creativity in a balanced way, your stress is reduced and your heart is lightened. While people from all walks of life have enjoyed this work, it is especially resonant with women who seek something more, who have an affinity for the meditative and who long for the light-hearted. Women’s visions & women’s voices are catapulting at this time in their own lives and on the planet. This creative, intuitive, peace-offering way, in which I work, fully supports that. Enjoy your visit and check back soon for the upcoming free three-part series on journaling and your creativity! Sign up for CREATIVE COMPASSION HERE! 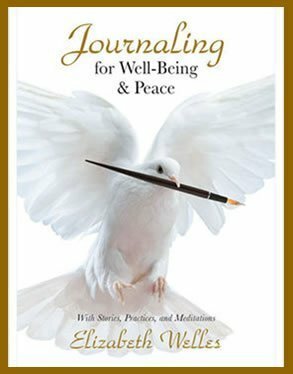 Journaling for Well-Being & Peace is the essential “how to” book on journaling that shows you how to relieve stress and heal from loss, how to enhance your creativity, and how to discover your vision and voice that are gifts to a world in need. 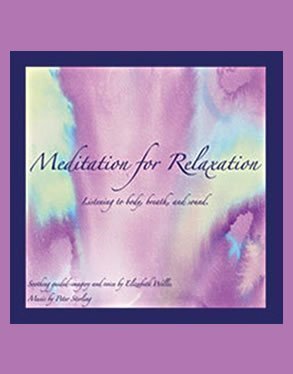 Meditation for Relaxation contains two powerful meditations to relax and nourish yourself body, heart, mind and soul. 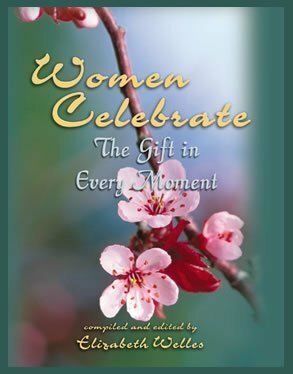 Women Celebrate: The Gift in Every Moment contain stories of adversity and grace, joy and strength that celebrate the body, heart, mind and soul, while honoring the journeys women take to reclaim their joy. Storytelling is as old as time. Through story, song and dance we have lived and loved, created community, celebrated and grieved. Stories make us uniquely human and connect us soul to soul. They are a road and a path into the silence, from where more stories will spin, and they are the breath of Life singing, to us, Her song. Meditation is an ever-deepening investigation into silence, the great silence, where peace reigns supreme. Solutions, creativity, and healing all happen in the in-between, in the space between what was and what will be. Meditation aligns us to this space, to the Unknown, to grace, peace, and love. Elizabeth Welles is an author, actress, storyteller and teacher. She weaves words, story and soul to create shows that combine comedy, drama and surprise. 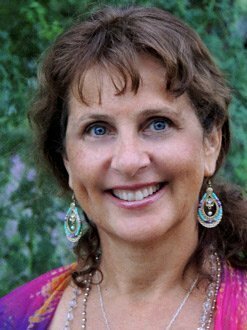 Her books and workshops touch the human heart, while her warmth and quirky sense of humor endear her to people around the world.